This is a huge opportunity to cement and extend the progress that has been made in efforts to sunset gillnets out of the main-stem Columbia River. 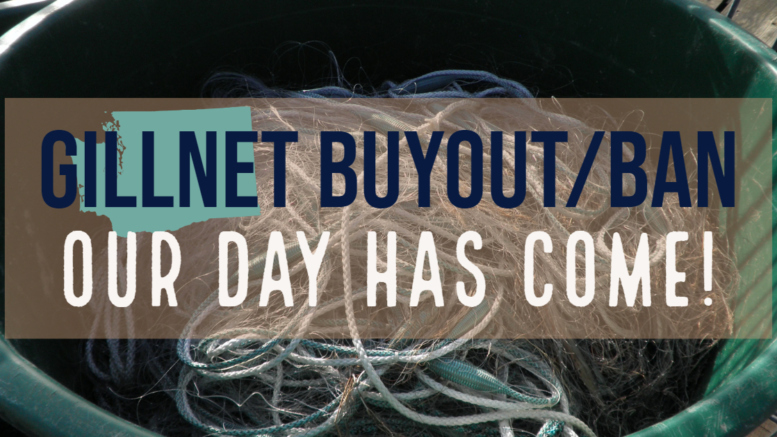 This bill is a step forward for fish, orcas, selective fisheries statewide, and will reduce the invisible plague of ghost nets in state waters. We are under no illusions that this change will be a magic salve for the fish, orcas, or our salmon habitat, it’s a single step in the right direction. While we enthusiastically support changes to selective fisheries, we would be remiss if we didn’t state the obvious caution: this change will not have a magical impact on our collapsing Puget Sound salmon ecosystem. This is a multi-dimensional problem — and success lies in paring selective fisheries with substantial changes in the other three H’s (Habitat, Hydro, Hatchery Policy). Those changes will require greater political will and costs than this SB 5617, so keep your helmets on, there is much more to do. But let’s not let the perfect become the enemy of the good. This is a good change, and we are excited to see so many senators participating in fisheries issues. Please take some action to support them! Finally share this story to your friends, family and on social media. Get the word out!!! For clarity sake, we should point out that this ban will only affect non-tribal fishers, and surely that will be a source of frustration for some. But this is a moment to remind ourselves to not let the perfect become the enemy of the good. SB 5617 is a good bill, and it deserves your support! 6 Comments on "Pack Up Your Nets!!" I would like to have the names of the Senators who voted no on this bill. I’m certainly in favor of getting the nets out of all Washington waters. But if your organization is advocating for breaching the Snake River Dams, that I can not support. They are not the real problem and their removal will bring economic ruin to not just Eastern Wa. But hurt the whole state by if nothing else, taking clean energy out of the equation. There should be an additional limiting of tribal nets if, all nontribal are completely banned. Retire gillnet permits? You mean transfer the permits to commercial tribal gillnetters so they can continue to not attain their quotas, gillnet the rivers where apparently this practice does not affect a salmon run returning to spawn as much as a hydro electric dam does….really? Its all about the $$$$ not the salmon runs they’re just trying to eliminate the competition. I see 27 sponsors listed on the Senate Bill Tracker! What about the commercial Beach seiners and Purse seiners??? ?